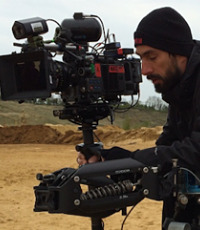 Mihalis is a Steadicam owner-operator based in London, with more than 15 years experience in the camera department. In the past few years, he's worked predominantly as a Steadicam or Camera Operator on features, dramas and commercials. He prides himself on his technical skills and the ability to communicate effectively with Directors and DOPs, providing them with the required shots. Tiffen Shadow sled, GPI Pro Titan arm, WK vest, Wireless Link, Wireless LCS, Garfield mount, Sunbounce Windkiller, Magliner JR, Director's wireless 7" monitor. Can also provide the Arri Trinity stabilisation system. The Ronin 2 gyrostabilised gimbal is also available for hire, with A1 Tools wireless wheels. Please enquire for any additional equipment requirements.